Bloomington, Indiana – The state agency that oversees pipeline safety says it will not play a part in any investigation into a pipeline failure that spilled thousands of gallons of jet fuel into a river in northeast Indiana. The Indiana Utility Regulatory Commission’s Pipeline Safety Division says the St. Mary’s spill in Decatur is outside its jurisdiction. Federal, state and local authorities continue the effort to clean up the remains of 8,190 gallons of jet fuel accidentally released into the river Sept. 8. According to Buckeye Partners L.P., the Texas-based company that operates the pipeline, 8,190 barrels of jet fuel were spilled due to a pipeline failure Sept. 8 in a pipeline that runs through the town. The company says it is investigating the cause of the failure, and will shut down the pipeline until it is repaired. Buckeye has also set up a website with updates on the spill. Indiana is home to thousands of miles of pipeline. The EPA says a majority of the spilled jet fuel has either been recovered, dispersed or evaporated, but the agency will continue to monitor the air and water in communities surrounding the spill. Decatur Mayor Ken Meyer told the Indiana Environmental Reporter there is no threat to the public and the city’s drinking water was unaffected by the spill. He says the drinking water comes from underground wells, and initial tests have not found any jet fuel contamination. The U.S. Environmental Protection Agency and Indiana Department of Environmental Management are monitoring air quality, but say no hazardous air quality readings have been detected. Pipeline operators working only inside the state fall under the jurisdiction of the Indiana Utility Regulatory Commission’s Pipeline Safety Division. The commission is responsible for conducting inspections, investigating incidents and enforcing federal and state pipeline regulations and statutes for those operators. The IURC says the jet fuel spill in Decatur is out of its jurisdiction, and will not be involved in an investigation. Data show that the IURC reported 2,756 gas pipeline violations found between 2001 and 2015, but reported only 1,806 violation corrections. From 2009 through 2015, the IURC reported 10 hazardous liquid pipeline violations, but only reported eight violation corrections. Pipelines operating in more than one state fall under the jurisdiction of the U.S. Department of Transportation’s Pipeline and Hazardous Materials Safety Administration. Their investigators would oversee any incident investigation and subsequent failure analysis. The PHMSA can issue warnings and tickets for minor violations but can also refer cases for more serious sanctions. Under current law, the PHMSA can assess civil penalties of up to $50,000 or refer cases for criminal prosecution. The PHMSA has not said when or if it will investigate the Decatur spill. The U.S. Department of Transportation’s Pipeline and Hazardous Materials Safety Administration oversees the nation’s pipeline transportation system. 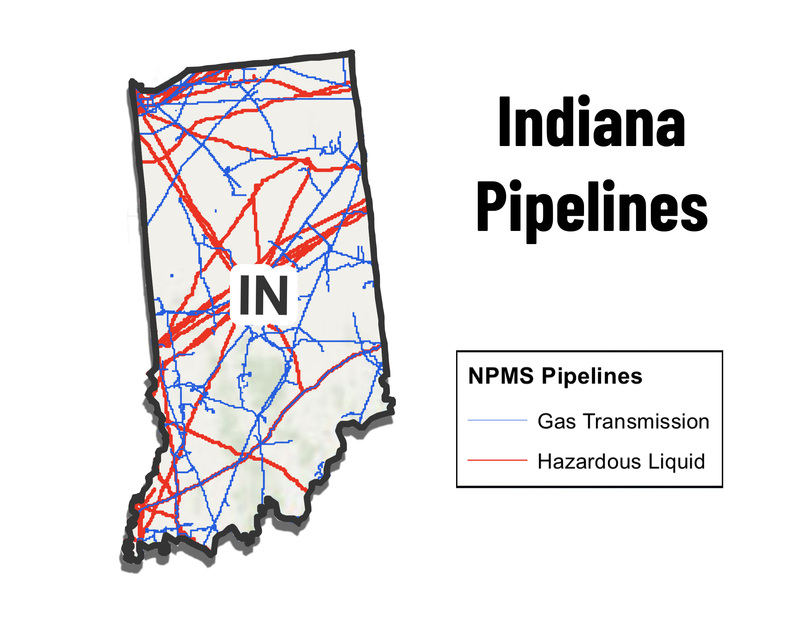 Its data show Indiana hosts than 81,059 miles of gas pipelines and 4,026 miles of hazardous liquid pipelines. Since 1998, 216 pipeline incidents have been reported in Indiana, resulting in 9 deaths and 27 injuries. Fifteen incidents were reported in 2017. Of those, a third were due to material, welding or equipment failures. The Indiana Utility Regulatory Commission’s Pipeline Safety Division says the St. Mary’s spill in Decatur is outside its jurisdiction. Interstate pipeline operators like Buckeye Partners L.P. are regulated and overseen by a federal agency, the U.S. Department of Transportation’s Pipeline and Hazardous Materials Safety Administration. No word yet on when or if an investigation will be launched.